Having a cold is no fun, and as I learned a couple of weekends ago, having a toddler with a cold is probably worse. I can’t complain, this is the first bad cold he’s ever had. He is 18 months, so I count myself very very fortunate. To treat his cold, as much as you can treat something that just has to run its course, I gave him foods, supplements and remedies that would boost his immune system and tame his symptoms. I rather leave the medicine, even OTC medicine, for when I really need it. By day three, his cold was pretty much gone. Since colds are bound to happen, to kids and adults alike, I thought I’d share what I do to make my family feel better when we get them. You can do this too, it is not just for kids. Just a word of caution. I am not a doctor and this is in no way meant to replace a doctor’s advice. We are all fortunately healthy in this household. We have also just visited the doctor for a routine checkup, so I knew that this was just a cold. 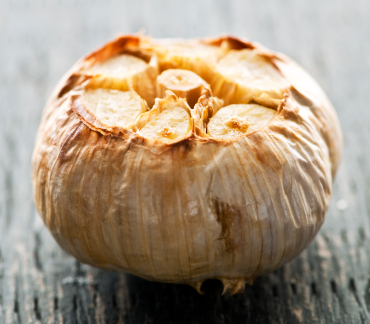 Roasting garlic is a delicious way to get some of its benefits. Once cooked some of its properties are lost, but the garlic has a butter-like consistency, and it is not pungent. It is a joy to eat. No dairy: We don’t eat much dairy around our house, but this weekend it’s been completely nixed. Many people belive that dairy makes the body produce more mucus even though research has shown that it doesn’t, it may just loosen it. I still rather avoid it. Bulb Syringe: While adults can blow their nose, my son has not yet mastered this skill. I have a wonderful tool called a Snot Sucker that works amazing, unfortunately with our current temporary living situation I could not find it. I used a bulb syringe instead to clear his nostrils before bed time and when I saw he needed it. He hated it the first time, afterward he thought the noise it made was funny. The Snot Sucker would have been my preference. Homemade vapor rub: Instead of buying the commercial kind, I have a vapor rub I made with coconut oil, and peppermint and rosemary essential oils. It smells like candy and helps clear the nasal passage. By the way, commercial vapor rub is not for children under two, as it can be toxic if ingested. Steam: On the day when his congestion was worse, I made a steam room of sorts in the bathroom, just running hot water in the shower, I added a couple of drops of peppermint essential oil to help clear up the congestion. Cloth wipes: I’ve used a mix of paper and cloth wipes, but I found the cloth ones to work best to keep my son’s face clean, especially when damp. It is also more gentle on his face, so he doesn’t have chapped skin on top of everything else. Dry skin: Colds dry you out, instead of lathering him up with lotion, which he hates, I use coconut oil. He looks shiny right after I put it on his skin, but the body absorbs it quickly and he doesn’t seem to mind it. Fluids: Moms and doctors agree, drink lots of fluids or you’ll get dehydrated and feel even worse. Garlic: It has antibacterial and antibiotic properties, and has been used for a long time to prevent colds, among other things. Research suggests that it can, in fact, prevent them. Shiitake mushrooms: They are used in Asia to strengthen the immune system, and there is some research that suggests potential cancer-fighting properties. For the cold, I am glad they do seem to work to boost the immune system, plus they are delicious in soups or sautéed with garlic. Ginger: The spicy nature of ginger warms up the body from the inside and is used in eastern medicine for this property. It also settles the stomach, which I often need when I have a cold. Miso paste: Miso is a traditionally fermented food with both natural probiotics and prebiotics that help maintain a healthy gut flora, necessary for immune health.You could use sauerkraut or other fermented foods, but my son likes miso, so I add it to his broths after I’ve served them. If you boil it, its properties are lost. Probiotic powder: I add it to his water to put more healthy gut bacteria into his body. I do this often, but especially when he is sick. Elderberry syrup: Boosts the immune system, and adds color and flavor to his water- not that he needs that, but he seemed to be OK with it. Mullein & garlic ear drops: This mix is used for the treatment for middle ear infection pain. I’ve been giving him these ear drops twice a day, in hopes that it won’t only sooth, but also prevent a potential ear infection. They must make him feel good because he lets me do it without a problem. Cod liver oil: It seems like it has become quite the trendy supplement, especially when you are dealing with sick kids. I give my son cod liver oil daily, I also take it for the very important DHA and EPA in it. During his cold this was no exception, and the vitamins, A and D, in it can sure help him get better. Lots of sleep: Although the first two nights were a bit rough, he woke up every couple of hours completely stuffed up and unable to breathe or sleep, his naps have been nice a long, which I encouraged. I’ve been able to get him to consume all these things mostly by making soups, which are easier to eat when you are sick, anyway. I made a fairly thin carrot, garlic, shiitake and leek soup with miso one night, which he loved, and on Sunday when his appetite came back with a vengeance, he ate a lot of homemade chicken soup, which had quite a bit of garlic in it as well. During and after my son’s cold I did most of these things as well, and aside from some sniffles I never got sick. How do you treat your colds? Do you use natural remedies?